What Is DD Form 1348-7? 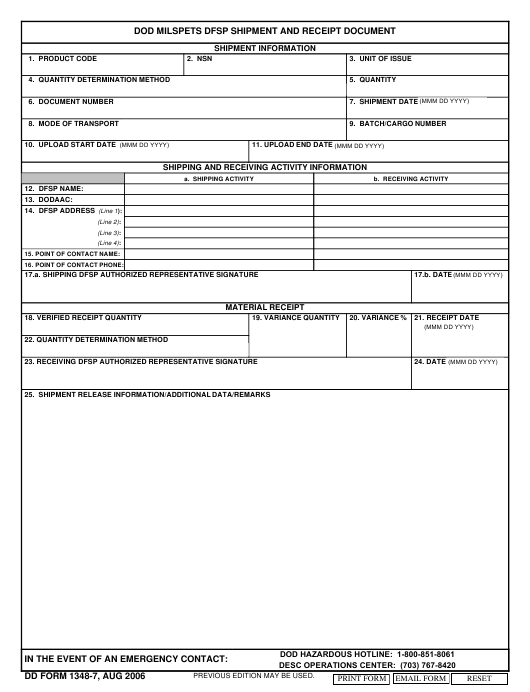 DD Form 1348-7, DoD MILSPETS DFSP Shipment and Receipt Document is a form used for recording Department of Defense (DoD) sales, returns, and issues. The form may also be used to document issues to non-DoD units under bilateral agreements. The form - sometimes incorrectly referred to as the DA Form 1348-7 - was last revised by the DoD in August 2006 with the previous editions still in use. A fillable DD Form 1348-7 is available for download and e-filing below or can be obtained through the Executive Services Directorate website. Enter the unit of issue. shipment quantity. If using the Adobe fillable version, select the determination method from the drop box. shipment quantity if for a consolidated shipment document. number). For example, the first JP8 shipment for 16 Jan 06 from FP4418 would be FP44186021J801. Enter the date of the shipment (Mmm dd, yyyy). Enter the cargo or batch number if applicable. Enter the date the shipment upload began (Mmm dd, yyyy). Enter the date the shipment upload was completed/ended (Mmm dd, yyyy). Enter the name of the Shipping DFSP in column a. and the name of the Receiving DFSP in column b. Enter the DoDAAC of the Shipping DFSP in column a. and the DoDAAC of the Receiving DFSP in column b. Receiving DFSP in column b. Enter the signature of the Shipping DFSP authorized representative. Enter the date signed (Mmm dd, yyyy). The Receiving DFSP must enter the verified receipt quantity. fillable version of the form, the total variance will automatically comppute when the receipt quantity is entered. when the receipt quantity is entered. Enter the date of the receipt (Mmm dd, yyyy). as the receipt quantity. If using the Adobe fillable version, select the determination method from the drop box. Enter the signature of the Receiving DFSP authorized representative. the shipment document as applicable. The DD 1348-7 form can be filled in using a computer or printed and completed manually. The paper consists of three parts: Part I is Shipment Information, Part II is Shipping and Receiving Activity Information, and Part III is the Material Receipt. Part I includes eleven boxes. It is mostly self-explanatory: this section requires complete data about the shipment. That includes a product code, the NSN, and the unit of issue in Boxes 1, 2, and 3 respectively. Box 4 requires the quantity determination method. The digital version of the form allows choosing the method from a drop-down menu. The manually filled form requires specifying if the gross or net is reflected as the shipment quantity. Box 5 requires specifying the applicable quantity of the shipment. Box 6 is for the shipment document number. The date of the shipment in MMM DD, YYYY format goes in Box 7. Box 8 requires the appropriate method of transportation. Select the appropriate mode of transport from the drop-down menu in Box 8, if using the electronic version. Otherwise, inscribe it manually. Box 9 should contain the cargo or batch number. Boxes 10 and 11 require the dates of the beginning and the end of the shipment upload. Part II contains the details about shipping and receiving activities. Box 12 to 16 are divided into two columns: Column A is for the Shipping Activity data and Column B is for the Receiving Activity info. These columns should feature the DFSP name, address, DoDAAC, the point of contact name and phone number for both the Shipping and Receiving Activity. The authorized representative of Shipping DFSP should sign the document and provide the date of signing. The Receiving DFSP should specify the verified receipt quantity in Box 18. In the digital version of the form, the difference between the quantity shipped and quantity received will automatically be calculated in Box 19. Otherwise, it should be calculated and entered manually. The same goes for the percentage of the variance specified in Box 20. Box 21 should contain the date of receipt. Box 22 is for the receipt quantity determination method. The signature of the authorized representative of the Receiving DFSP and the date go in Boxes 23 and 24 correspondingly. The last Box is reserved for remarks, alternate release information, and other data.